But nothing could have prepared her for Hunter Armstrong. He's a Navy SEAL, driven, confident, and dangerous. And he plans to do more than just protect her. Book 2 of The Muse Chronicles, continues this series about a group of modern day women, each with a Muse that lives inside her. Muses, as in Greek mythological beings-daughters of Zeus. These women are trying to renovate an old theater in order to facilitate all things artistic, for the ages. Of course, it’s not that simple. There’s a group out to get them and they want to wipe out all of the Muses. This time around is Callie’s turn. She was one of the more noticeable peripheral characters in the first book, so I was looking forward to her story. Callie is the Muse of Epic Poetry, but only in a kind of spiritual way. At the age of eighteen the Muse woke up inside of her. Of course, she’s still human, she just is aware of the Muse and what she must do for society. She’s also a psychiatrist and works with the military. Hunter Armstrong is a Navy Seal, home temporarily. All he needs is for the base psychiatrist to sign off on him being able to continue in his job after he was involved in a rougher than normal mission. He is assigned to Callie, as her patient, and is pretty much smitten with her at the first meeting. She, of course, won’t go out with him, as she would never jeopardize her career that way. But Hunter has a plan, and so ethically, she is able to finally go, and teaching her to surf seems the way to go. As in the first book, Hunter was born with a birthmark. It starts bothering him as soon as he meets Callie. And he develops a special psychic talent at the same time. He thinks he’s nuts, but of course Callie knows better. As with book one, the group that is trying to eradicate them still didn’t make a lot of sense to me. They were lethal, but seemingly inept at times. They think the Muses must be stopped from bringing any kind of good to the world. Meanwhile, they are drilling into the earth’s core, via an oil well, to try and break out an even worse group that is imprisoned there-for centuries. Here’s the thing, they have no proof the group even exists. As I said, this part of the plot was a bit weak for me. There’s more involved of course, but this is the gist of it. What I enjoyed the most was the characters and romance and since that was at least 70% of the book, that made this a fairly good read for me. The main characters from book one, Lure of Obsession, are pretty major characters in this one as well. We see some more of the other Muse’s, not a lot, but enough to wonder who will have the next book. And we also find out who else has a birthmark, which was unexpected. There’s a few scary moments, a few edge of your seat moments, and all of that really added to the story. There is of course some steamy scenes. In future books I would like to see more about the renovation and what is planned and how they are supposed to make such a mark on all of society that this nefarious group needs them dead. But Lisa Kessler knows how to spin a good yarn, and this is yet another one under her belt. I am sure she has a plan for all of this. I would recommend this to adult light paranormal romance fans-as in light on the paranormal aspects. A copy of this book was provided to me by the author. All thoughts are my own, and I received no compensation for this review. Glad that characters and romance made up for everything else wrong with the story. 😉 Wonderful honest review, this does sound interesting although frustrating somewhat as well. I love Lisa Kesslers writing. And there’s certainly nothing wrong with the book. I just have been struggling with the reasons behind all the suspense and how the Muses can change the world enough with a theatre that they pose such a threat. Hopefully that will be answered soon. 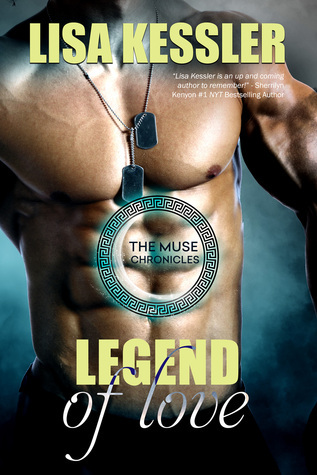 Thanks for reviewing Legend of Love, Lorna! Going to guess that this comment is for Lisa? The weak aspects of the tale concern me, but I am glad that overall you enjoyed this Lorna. Thank you Kimberly. That’s it exactly. The reasons are a tad weak for the suspense. I think its a creative idea for a paranormal world. I want to read her werewolf series first and the vampires, but neat that there is this one, too. I know lots of people just read for the romance in a PNR but everything has to make sense to me, you know? Maybe I am just a stickler and should just get over it! The concept of this series with the muses sounds very original and intriguing! That part about the group who acts against the muses does sound like it doesn’t make a lot sense, but I am glad you still enjoyed the book. Great review!